Professor Robert Merton gave an insightful speech at the High Table Dinner. 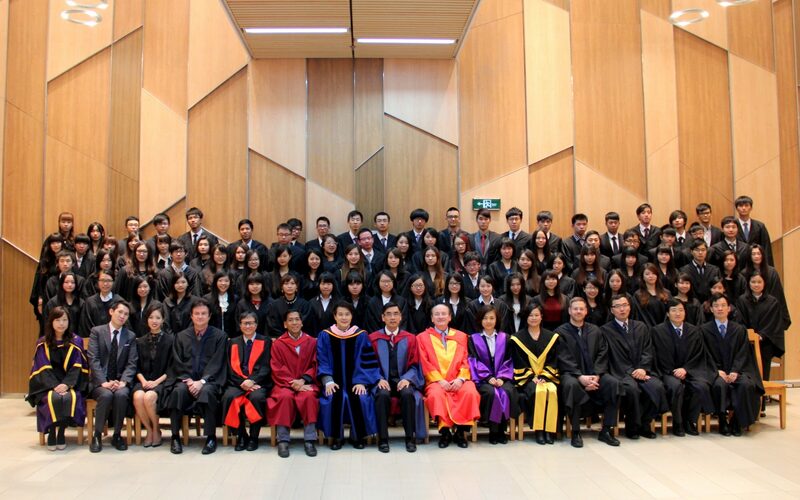 On Sunday 7th December, Stanley Ho East Asia College (SHEAC) held a Master’s Tea and the second High Table Dinner. 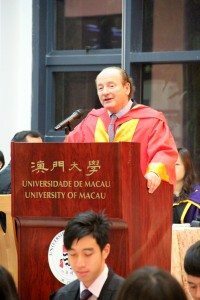 SHEAC was honored to be able to invite Professor Robert C. Merton, Laureate of the 1997 Nobel Memorial Prize in Economic Sciences and this year’s recipient of an honorary doctorate from UM, as Guest of Honor of the two events. With the company of College Master Professor Iu Vai Pan, and Associate Dean of the Faculty of Business Administration and SHEAC Fellow Professor Rose Neng Lai, Professor Robert Merton first joined the Master’s Tea at the College Library at 5:30pm. The objective of the Master’s Tea is to provide a platform for the guest and students to discuss a specific topic or certain key areas of concern in a relaxing and interactive format for more effective interaction among participants. 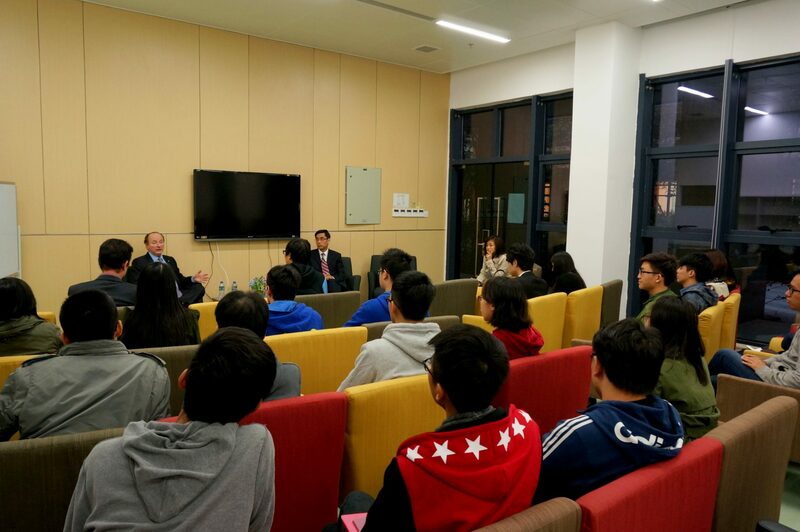 At this Master’s Tea, Professor Merton shared with students his views on three particular aspects, including his pathway to personal and professional success, the world economy and financial market, as well as university life and career planning. In response to students’ multifaceted queries, Professor Merton used terms and examples that were common in daily life so that students could comprehend the discussed concepts more easily and relate more effectively to the discussion. 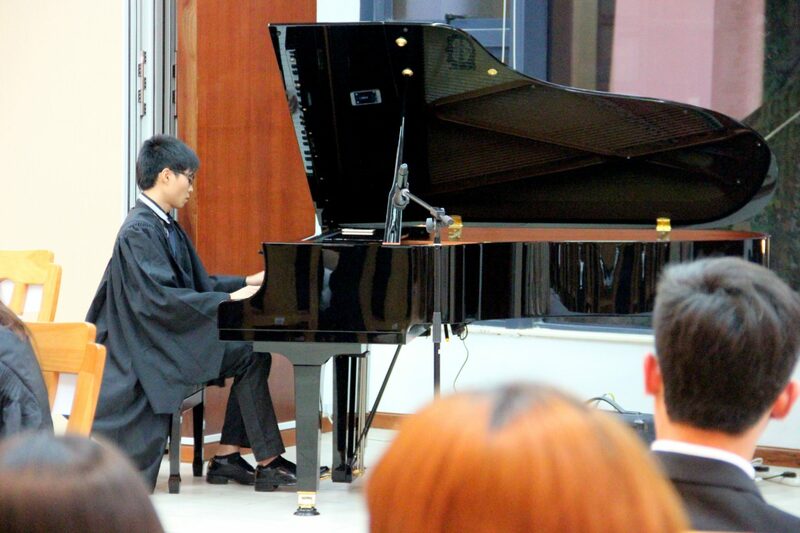 Wesley Lao (Year 4 Financial Controllership) played “Dream Wedding” and two other improvised piano pieces. 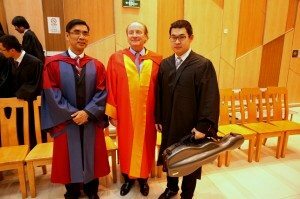 At the beginning of the High Table Dinner, College Master Professor Iu gave a brief opening remark, and introduced Professor Robert Merton, the Guest of Honor, as well as the participating Fellows, among who were Dr. Hoi Pui Man, Maggie (Institute of Chinese Medical Sciences) and Dr. Brian J. Hall (Faculty of Social Sciences), both of whom recently joined SHEAC. After the welcome speech of the College Master, Professor Merton delivered an insightful speech to the audience. In particular, he mentioned, “success largely depends on good luck, but hard-working people tend to have more good luck.” His liberality and modesty impressed everyone at the dinner. Janet Li (Year 1 English) performed a violin solo “Meditation”. More than 200 smartly-dressed students attended the dinner. Such a glamorous night was embellished not only with delicate dishes and good wine, but also with solo performances by students. Miss Wu Yang, a member of the recently established SHEAC Student Ambassador Team, served as the emcee at this High Table Dinner. 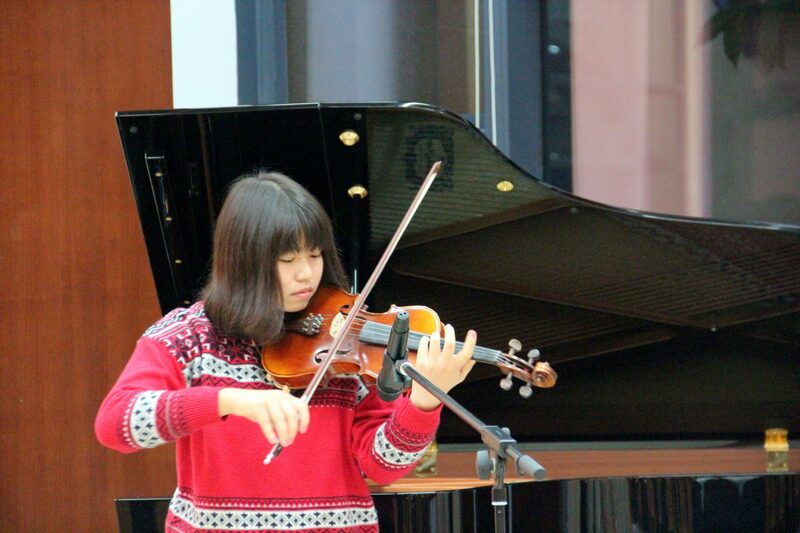 Miss Janet Li and Mr. Robin Liu each brought to the audience a violin solo, respectively, “Meditation” and “Csardas”. Mr. Wesley Lao played “Dream Wedding” and two other improvised pieces on the new grand piano. 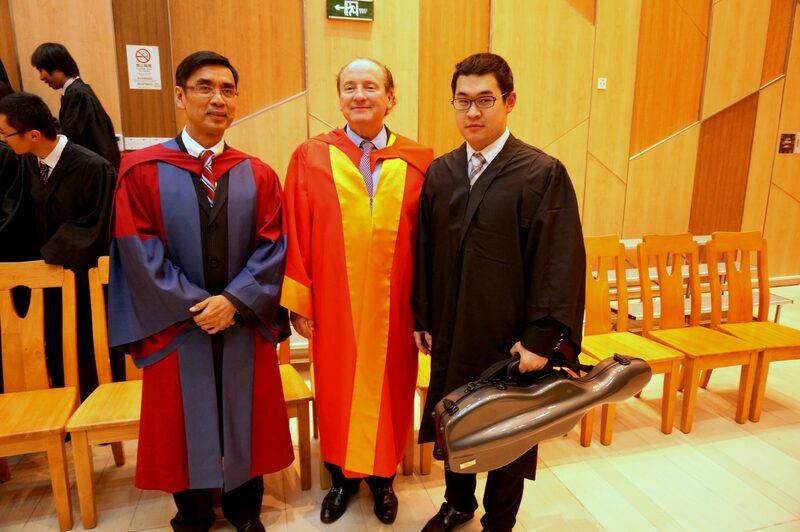 Professor Robert Merton and College Master Professor Iu had photos taken with one of the student performers Mr. Robin Liu after the dinner. After the dinner, many students and fellows stayed behind to take photos together, and grabbed this rare opportunity to also take photos with Professor Merton. The High Table Dinner not only provided a relaxing opportunity for students who were busy revising for the final examinations, but also fostered closer interaction among students and between students and teachers, so that students could gain social skills and experiences in various aspects of life. Professor Robert Merton, College Master, Fellows, and students lined up for a group photo. Professor Robert Merton discussed with students questions related to aspects such as global economy, personal growth, and university life. 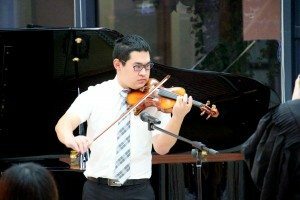 Robin Liu (Year 1 Electrical & Computer Engineering) played a violin solo “Csardas”.